A case study of a political organization. Chemistry research of enzymes and proteins. Geological research of northeastern Minnesota. And a production of the musical Thrill Me. With class recess during the months of June, July, and August, most Gustavus students pack up and head home. For some Gustavus students, however, summer provides a three-month opportunity to conduct research or work on an independent, academic project with professors such as those listed above. 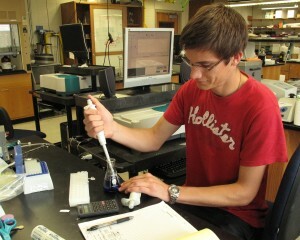 Research and project-based work is conducted in several departments on campus under the direction of faculty advisers. This enables students to learn more about a topic they are interested in, expand upon the more traditional textbook learning, and gain experience for potential post-graduate studies. A Research Symposium presented by the chemistry department to showcase student work will be held Sept. 25 from 9 a.m. to 1 p.m. in Nobel Hall. The performance of the musical Thrill Me, written by Stephen Dolginoff and directed by Gustavus theatre and dance professor Henry MacCarthy, will be performed at the Lowry Lab Theatre in St. Paul Sept. 16-19. And many of the summer research projects may be featured at the 2010-2011 Celebration of Creative Inquiry, to be held May 6, 2011. Very Interesting Article Hanna! I very much Enjoyed the Video, I found out some new things I didn’t know about summer research! Well done Hanna! Congratulations on a very informative and interesting video about summer research, Hannah. I really appreciate the effort you put into this story and find it quite helpful. I hope many people get a chance to see it.